– Automatic gearbox: Press the brake pedal and move the selector lever to position P or N ⇒ . – Press the Start/Stop button, fig. 131 to start the engine. When starting from cold the engine may be a little noisy for the first few seconds until oil pressure has built up in the hydraulic tappets. This is quite normal and no cause for concern. This message appears when you press the Start/Stop button if there is no remote control key inside the vehicle or if the system cannot detect or identify the key. This can happen, for example, if the radio signal from the key is obstructed by a metal briefcase or similar. Electronic equipment, such as mobile phones, can also interfere with the radio signal from the key. This message will appear together with the symbol if the remote control key is removed from the vehicle while the engine is running. This is to remind you not to continue driving without the key (for example if you change drivers). If you open the driver's door while the ignition is switched on, a warning buzzer will sound, and the message Ignition is on will appear in the display. In this case, please switch off the ignition. 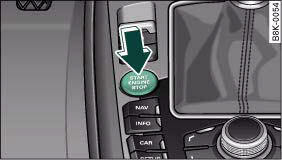 – Automatic gearbox: Move the selector lever to position P or N.
– Press the Start/Stop button, fig. 131. Should it be necessary in an emergency, the engine can be switched off when the selector lever is in position R, D or S. To switch off the engine (max. speed 10 km/h) press and hold the Start/Stop button and keep your foot on the brake. If the engine has been working hard for a long time, there is a risk of heat building up in the engine compartment after the engine has been switched off; this could cause engine damage. For this reason, you should leave the engine idling for about 2 minutes before switching it off. After the engine is stopped the radiator fan may run on for up to 10 minutes, even if the ignition is switched off. The fan may also start running again after some time if the coolant temperature rises due to a build-up of heat, or if the engine is hot and the engine compartment is heated up further by direct sunlight.